Watch the video link below to find out what this product does. What are Glycolic Acid Peels? Glycolic peels are safe exfoliating peels that can be used to remove acne scars, reduce the appearance of wrinkles & fine lines, reduce the appearance of large pores, and sooo much more! It is important to note that glycolic peels are safe if used as instructed. It is also essential to start at 10% and gradually increase in percentage until desired results have been achieved. Never start at higher percentages over 30%. See below for full instructions. Glycolic acid is a naturally occurring AHA acid derived from cane sugar. 99% of the AHAs used in the beauty industry are synthetically produced, but here at ASDM Beverly Hills, our glycolic acid is naturally sourced from cane sugar. Topically applying glycolic acid helps to chemically exfoliate the epidermis, removing dead & dull skin and bringing new skin to the surface. Glycolic acid stimulates the formation of new collagen, which reduces the appearance of fine lines and wrinkles. Its small molecular size allows it to penetrate the outer layer of skin, allowing it to slip beneath the epidermis, to reach the collagen fibers below. All of our glycolic peels are unbuffered, conserving their high strength and low pH level. For this reason we strongly suggest starting at 10% and slowly moving up in strength as your skin adjusts to the peel. We carry glycolic acid from 10% to 70%. Who should use your peels? 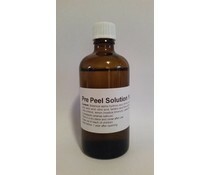 A deep peel only for those who have used 25-30% or similar glycolic solution before. To be used with caution or for professional use. The deepest peel, medical professional strength only for long time users of Glycolic Acid. This is our strongest solution and can quickly erase scarring and wrinkles when used properly. Step 6: To neutralize peel, apply several pumps of Post Peel Treatment Serum unto clean fan brush included with packaging. Apply liberally unto face. You can apply several layers of product unto face until you’ve completely covered all treatment areas. Upon application, you will feel a warm, tingling sensation which is normal. Mild foaming is also expected as acid is being neutralized. Once foaming action has ceased, acid has been fully neutralized. Regardless, leave on for a full 10 minutes, then rinse thoroughly. Follow up with your favorite moisturizer.